Custom car prints from the original hand drawn illustrations by Paul Bennett GMA. The professional British automobile artist Paul Bennett GMA is one of the country's foremost exponents in the art of automobile illustration and has produced this ever expanding collection of original hand drawn illustrations celebrating the heritage of the European motor industry.Paul is an artist of over 40 years experience, selling his work to collectors worldwide and has over time built up a truly vast portfolio of some of Europe's finest marques. You have a choice of an A4 print mounted on high-quality artboard ready for framing or a quality ceramic mug with your registration on the rear with an image of the excat model on the front. 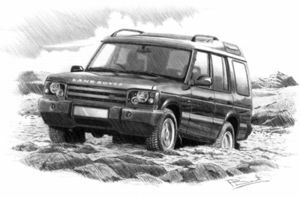 With dozens of Land Rover and Range Rover artwork images to choose from and to make this a unique gift all pictures come mounted complete with your PERSONALISED REGISTRATION NUMBER! Simply add the registration number of your choice in the personalisation box when ordering (maximum 7 characters) Despatched within 24 hours of order.